Fold Your Way to Fabulous Style With Origami Chic | YAYOMG! Are you a total fashionista longing for the day you’ll one day be able to rock the runway, design a dress, or even just sit in the crowd at New York Fashion Week? If so, we’ve got just the thing for you! It’s called “Origami Chic: A Guide to Foldable Fashion” – it’s part fashion lovers dream, part DIY-er’s fantasy, and 100% fabulous. 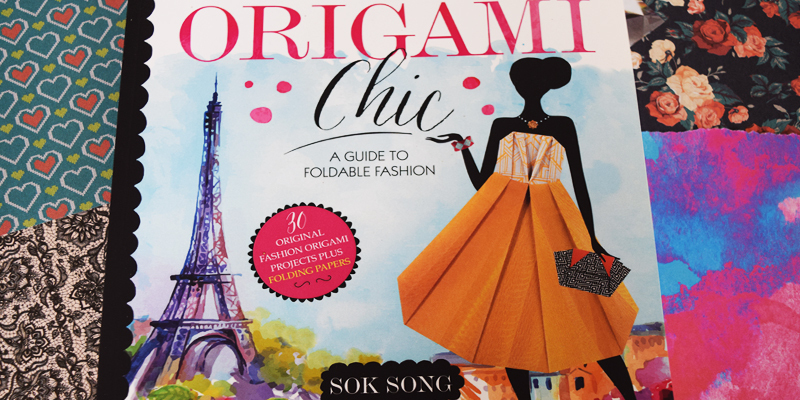 “Origami Chic” by Sok Song takes everything that’s great about the classic art of origami and makes it super hip and easy to learn for the modern day crafter. 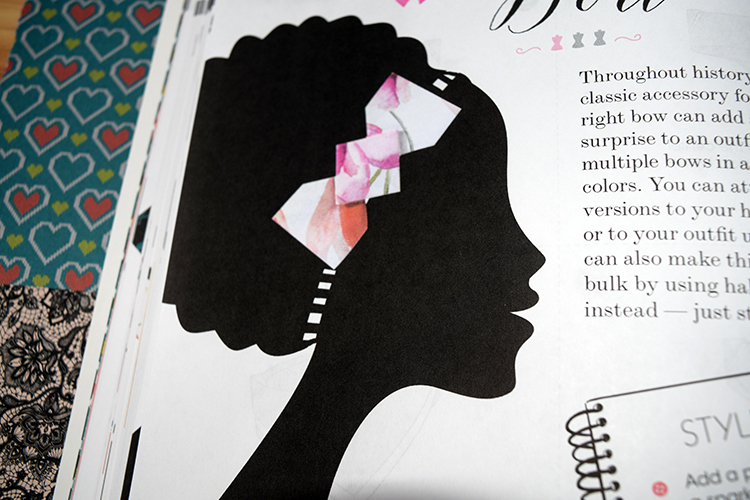 Even if you’re not generally into crafty stuff, we think you’ll love flipping through this totally glam book filled with fashion facts, folding tips, and 30 paper outfits for you to create. Each of the origami projects are ranked from Easy to Challenging and have pretty detailed instructions, so even a total beginner can pretty easily fold themselves a paper wardrobe. You’ll find everything from tops to dresses and even jewelry within the pages of this book. The best part? 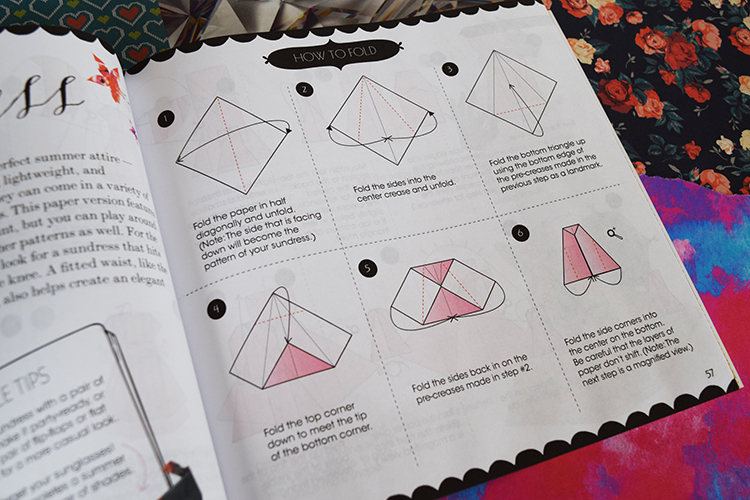 It comes with a ton of pretty patterned paper so you can easily get started on your new origami obsession. 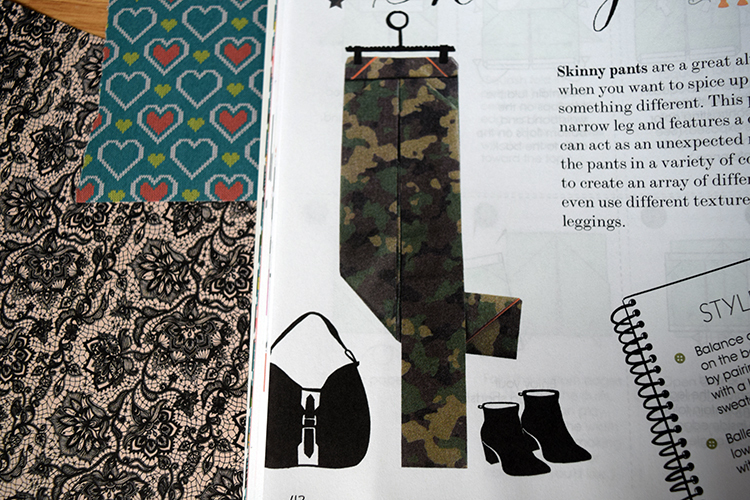 One thing we noticed while getting our fold on was how picking out which paper fashions we wanted to create was inspiring ideas for outfits we never thought we’d be brave enough to try IRL. That’s why we put together some tips for you on how you can use “Origami Chic” to inspire your real life wardrobe! Folding up a fabulous pair of skinnies? They’re a wardrobe staple that you probably already have quite a few of floating around in your laundry pile. The great thing about “Origami Chic” is that you can choose any pattern of paper to create your folded wardrobe, so what if you did the same thing with your real life jeans? Camo is a great place to start, especially since it’s so on-trend right now, but what about a pair of floral, polkadot, or even stripes? Skinnies (and leggings) come in all shades, patterns, and designs. Don’t be afraid to go BOLD this back to school season. Rock the halls with new confidence knowing that if you can fold it, you can wear it! Scarves aren’t just an easy way to stay warm or add a little flair to your outfit, they’re also a pretty easy thing to fold! Scarves come in so many different varieties, you could wear a different scarf each day of the week and still not have covered them all. There’s so many different lengths and ways to tie them, you’ll never get bored of styling your outfit around the perfect scarf. 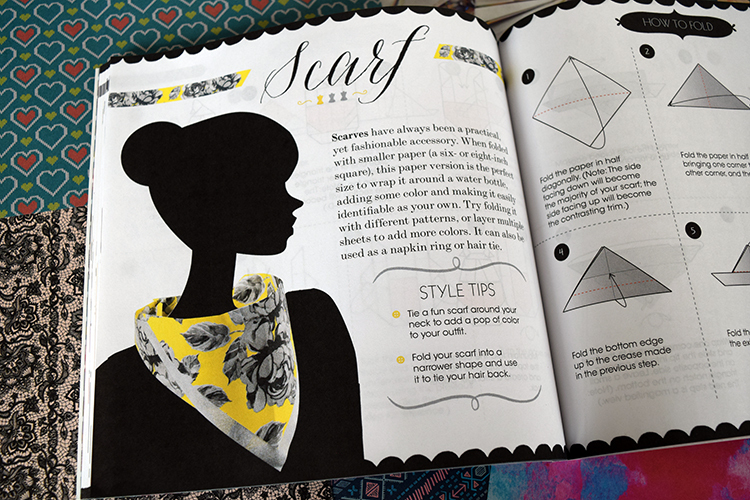 A tip they point out in the book is layering different paper patterns together to add more colors and create a unique scarf that’s totally you. You can also transform these scarves into napkin rings and hair ties. Wearing one of these paper creations in your hair is the perfect way to stand out like a true fashionista! When heading back to school this season, rather than an ordinary backpack, why not grab a bag oozing with style that matches your personality or even your mood? Instead of your plain ol’ solid color Jansport, why not grab a bold pattern like geometric or plaid? It’s time to start thinking of your bag as more than just a way to carry around all your books, pens, and calculator. Bags and backpacks come in so many styles that you can absolutely use yours to make a statement. 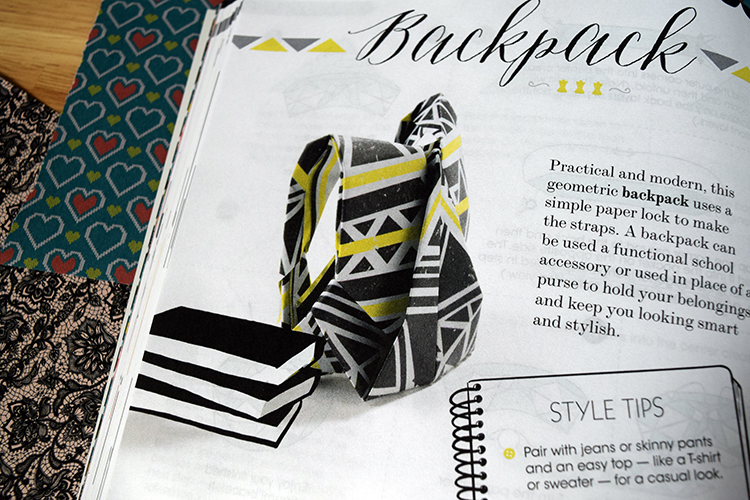 Fold yourself up an awesome backpack (or tote or clutch) using the instructions and patterned paper in the book if you can’t decide what you want. Having multiple bags on rotation is totally do-able. Snag a new bag every season or birthday and you’ll build your collection out quickly. 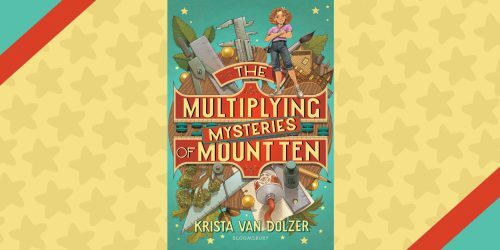 If you’re the kind of girl who likes to rock a solid color look (black tee, black jeans, black sneaks), a patterned backpack is a great way to accessorize your look in bring in a little pop of color. Sundresses are a wardrobe staple, but most people only ever wear them in the Summer. No one ever said you have to stop rocking sundresses in the Fall, all you need is a cute cardigan or a short denim jacket to wear over it, and you’ve transformed your favorite dress from a one season look to an (almost) year ’round style.While sundresses are traditionally floral printed, that’s not really the case anymore. 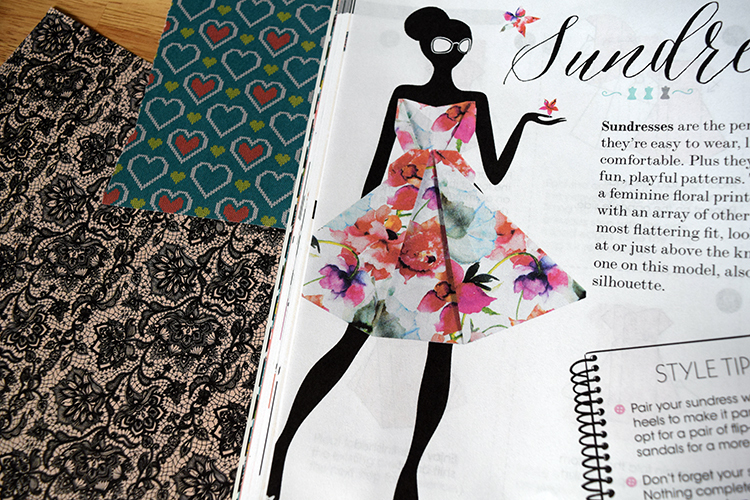 You can find them in tons of styles these days, including quite a few of the ones printed on the paper pages tucked conveniently in the back of your copy of “Origami Chic”. Pro Tip: There’s also instructions for jackets and sweaters you can fold, so you can put together and style your look in paper-form before you ever head to the mall to snag it for your wardrobe! 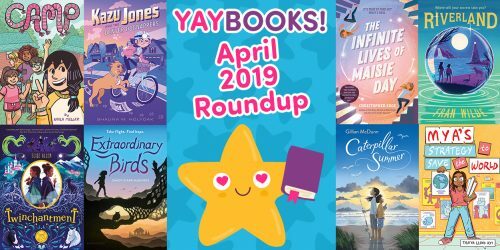 We told you this book was fabulous! Like real hair bows, these paper hair bows are one of the most versatile projects in the entire book. Why? Because once you’ve folded them, you can take it a step further and attach them to a headband, hair clip, or pin-back to rock them as part of your real life style. They’re the perfect way to spice up any outfit. Whether you decide to pin one of these to your bag or attach them to your favorite headband, we know that everyone you pass will be asking you where you got it. You’ll feel proud when you reply “I made it myself!” and then invite your new BFF over for a day of origami hangs! 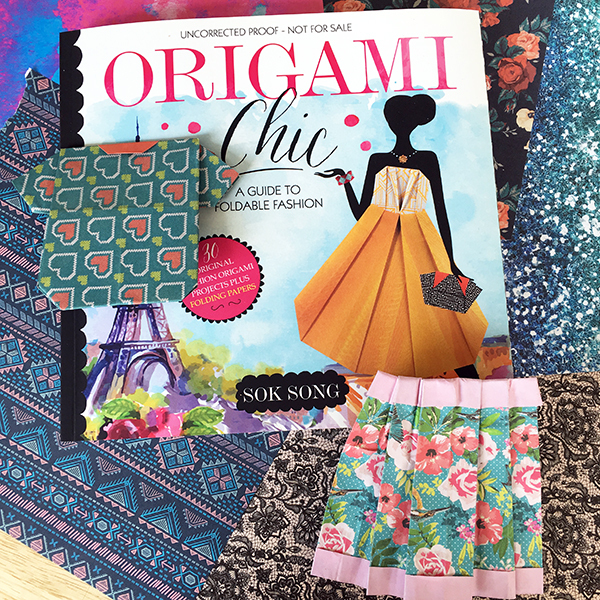 Now that you know how to use your book for both origami and real fashion purposes, it’s time to grab a copy of “Origami Chic” and get folding! 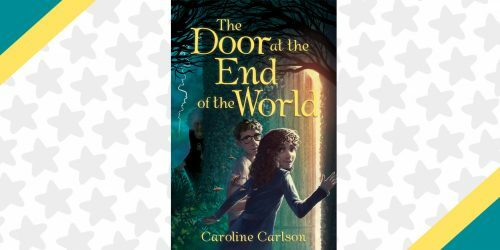 One last thing – thanks to our BFFs at Capstone for sending us an advance copy of this book. We had so much fun learning to fold these fabulous fashion pieces!